Click Read More for the video preview and to vote on your pick for the Game of the Week. I really hope Auburn wins to set up Oregon vs. Auburn for the title game. 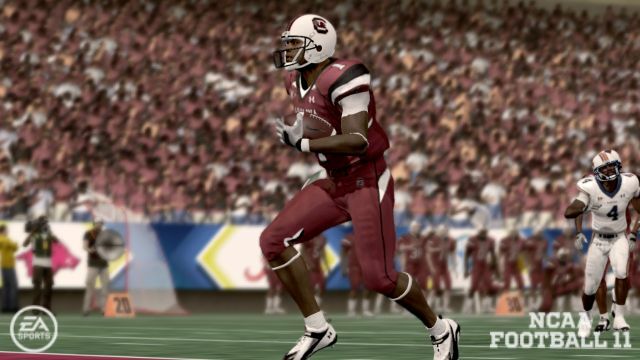 And the NCAA team better try hard to get those offenses working well in NCAA 12 - both for the human and especially for the cpu. This is a tough one. I *think* South Carolina finally has things figured out and is hitting stride at the right time. Auburn has dodged the bullet numerous times this season and whether it's this game or against Oregon, their luck is going to run out. Then again, maybe they are a team of destiny. I think as much as Auburn has endured....they keep pressing on. I think my boys have an excellent shot of becoming SEC Champions. They had Auburn down 20-7 in the 3rd qtr this season. Four costly turnovers in the 2nd half lead to them losing the game. I'm so sick of seeing Ca$h Newton and his smug grin. Here's hoping South Carolina can wipe the smug right off of that thug. GO GAMECOCKS! This is one of the few times that, despite how outlandish the predicted score seams, I actually think it's believable. Natch is right ... SCar gave them the first game. Hey, look at that! 42-14! Granted it's only end of the 3rd quarter, and it's Auburn who's doing the bitchslapping and not South Carolina.